We're not Irish (or at least not much) but I do embrace St. Patrick's Day -- I love the corned beef and cabbage and Irish soda bread. It is as much a tradition at Linderhof as turkey is at Thanksgiving!!!! But sometimes I rush the day as I did this weekend when I had a new recipe that I wanted to try -- cupcakes full of Irish "flavor"! And so on Sunday afternoon, I baked them . . . . and on Sunday afternoon, both of us stopped for tea at half past three. And the tea things aren't Irish but they are British -- the Spode Blue Room and Blue Italian. A lace cloth because when eating Irish, a lace covered cloth seems appropriate! The lamb molds on the table -- they'll be there until Easter. And the tea treat . 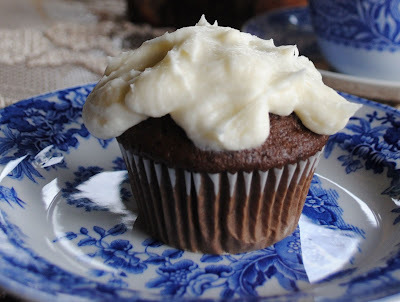 . .
Chocolate Guinness cupcakes with Irish Whisky Frosting! Husband Jim pronounced them yummy. (and actually begged for another!) The frosting replicated the "head" on a pint of Guinness. They would definitely make a good St. Patrick's Day treat for grown-ups! Preheat oven to 350. Line a 12 cup cupcake pan with paper cupcake liners. Whisk together the flour, brown sugar, cocoa, baking soda and salt into a bowl. In a separate bowl, mix the Guinness, oil, vinegar and vanilla until smooth. Pour the wet mixture into the dry mixture and whisk until well combined. Divide the batter evenly among the prepared cupcake liners. The cups should be filled about 3/4 full, and bake until a toothpick inserted in the center comes out clean, about 18 to 22 minutes. Let the cupcakes cool completely. Beat the butter on high speed for 1 to 2 minutes. Add powdered sugar and vanilla and beat to incorporate. With the mixer running, add 1 T. of milk at a time until it reaches the desired buttercream consistency. Add whisky, 1 t. at a time, until desired taste. Beat on high for 2 more minutes until very fluffy. It's Tuesday which means that it's Tea Time . . . . Let's join these parties!!! I hope Jim got his second cupcake. Even I would have liked a second. After all, it is (almost) St. Patrick's Day. They look and sound delicious. How delicious! I'm your biggest fan of teas at Linderhof. I just copied the recipe so I can make it...what the heck if we're not Irish, but embrace the St. been a Catholic! 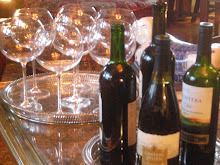 I'll be posting at Kathleen's tomorrow my St. Pat's tablescape. Hope you do too. What a fabulously yummy way indeed to celebrate St Patrick's day; with tea and grown up brownies!..,Yum! Have a marvelous week and St. Paddy's day! 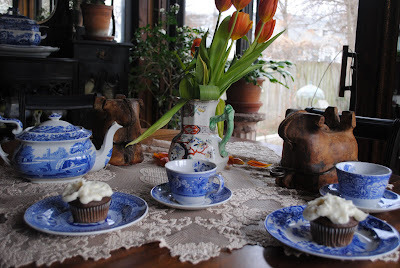 Your tea table is so pretty with the blue and white Spode and the orange tulips...but Oh my goodness do those Chocolate Guinness cupcakes with Irish Whisky Frosting look divine! I'm definitely copying the recipe to try. Hope you have a lovely St. Patrick's Day. A beautiful tea party you have set. I will have to try your recipe out, they look so good. Thank you for sharing. sounds yummy the ice cream store next to where I work has guiness ice cream. I tried it not bad. I is vanilla with frozen guiness through it. happy st patty's day. 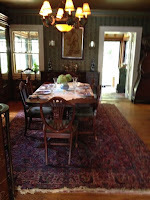 Your tea table looks very inviting, not everyone has china with shamrocks. The cupcake looks yummy,no wonder your husband wanted a second. What a scrumptious looking cupcake! I'll have to give this recipe a try. I'd definitely be cleaning the beaters after making that icing! What a treat! Those are the most amazing looking cupcakes! And I love your Spode, love the flowers too! I love your Spode! Your tea table looks wonderful and so do your muffins! Happy St. Patricks Day and thanks for joining me for tea. mmmmm sounds good! love getting tulips for the house but I will be so glad when they are up in my yard! Martha.....Goegeous blue and white tea set. 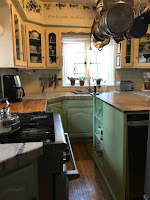 Thanks for sharing your recipe and I wish could join you for one of your tea parties. WE love St. Patrick's Day at our house...but we are Irish. WE have a huge party every year which we just held on Sunday. I want to have some guests over for Tea tomorrow but may not be able to due to some tests I am having done later today. 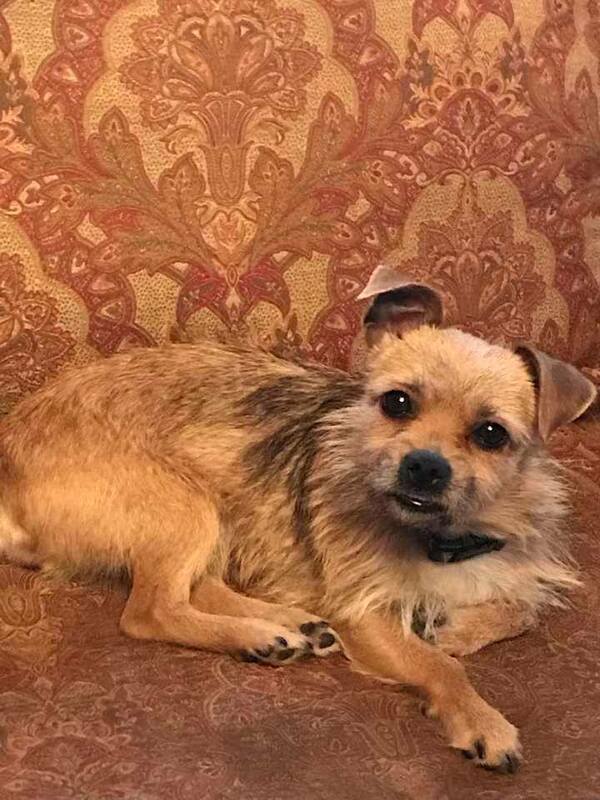 Blah!! Athough I took the day off to watch QVC...it's all Irish on the 17 of March every year. HA! Is your Tea pot and cups and saucers "Spode?" That will be the next set I think I am purchasing...love the Blue and White. Linderhof looks lovely with your blue spode ware, dear! 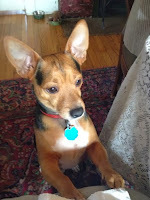 Your Irish Treat for Tea would make any Irishman (or woman) drop to their knees and , like hubby Jim, beg for more! Yummy! Happy Saint Patrick's Day! 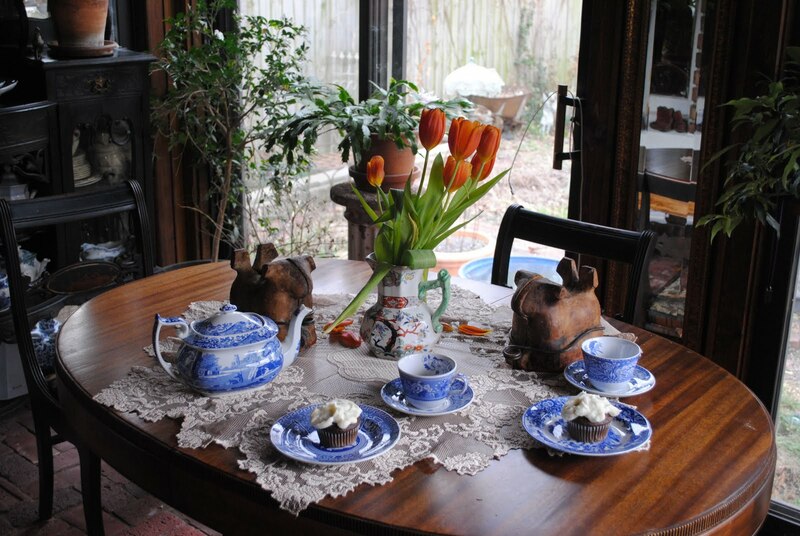 What a beautiful tea table with your gorgeous Blue and White dishes. Oh I have to copy the cupcake frosting recipe. My hubby would love them. 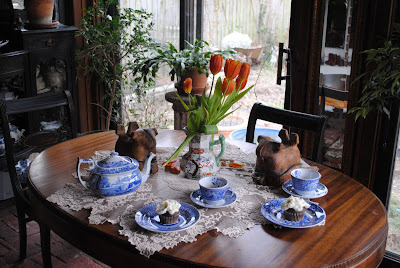 Such a lovely table with the Spode china and orange tulips. Blessings. Just a brief note but packed full of appreciation, for your post that you shared with us this week. The cupcakes sound wonderful and maybe not just on St Paddy's day.Beautiful Spode. I am eager to see you and what you design next week.